Equity of Health Care for Māori: A framework guides health practitioners, health organisations and the health system to achieve equitable health care for Māori. There are three actions that support the framework. Leadership: by championing the provision of high quality health care that delivers equitable health outcomes for Māori. Knowledge: by developing a knowledge base about ways to effectively deliver and monitor high quality health care for Māori. Commitment: to providing high quality health care that meets the health care needs and aspirations of Māori. The framework is based upon current literature in the field of quality improvement and research on improving access to health services for Māori, indigenous peoples and minority ethnic groups. The research was undertaken by Dr Fiona Cram (Katoa Ltd) and focused on diabetes, cancer and cardiovascular services – areas of high morbidity and mortality for Māori. It involved international and national literature reviews and key informant interviews. Five reports outlining the research (and supplementing the framework) can be found on the Katoa Ltd website. They include three literature reviews, a report on the key informant interviews and an overview of the findings of the entire research project. Ministry of Health. 2014. 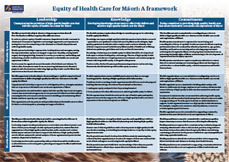 Equity of Health Care for Māori: A framework. Wellington: Ministry of Health.